Inviting small children to ‘guess the bones’ and to learn what goes on in the back of ambulances sounds guaranteed to appeal to the sometimes-lurid curiosity of young minds. In fact, interactive experiences like these are proving a huge hit with five to nine year olds who visit Southampton Children’s Hospital as part of a local initiative to reduce children’s fears of emergency treatment and get them thinking about accident prevention. The 999 Club began as a pilot project last year but proved such a success with schools in the area that it was recently given the green light and officially launched. The aim, says Suzie Knight, the hospital’s lead nurse for paediatric emergency care, is to show children what happens in emergency departments (EDs) so that if they should ever have to visit as patients, they will know what to expect. University Hospital Southampton NHS Foundation Trust youth and play services manager Joyce Stebbings agrees that a first visit to an ED can be alarming for children and young people. ‘This initiative gives pupils the opportunity to participate in activities related to emergency care and what they may see, hear or experience if they come into hospital via ambulance or with their parents as an emergency,’ she says. Despite that laudable aim some might suggest that inviting so many healthy, energetic children into a busy emergency care setting simply adds to workplace pressures experienced by staff. But Ms Knight says the benefits outweigh any concerns people might have. ‘It’s important that children know a bit about accident prevention and safety, and about coming into the ED. If a child then does have to come in for treatment and feels more relaxed, it’s so much easier to look after them,’ she says. 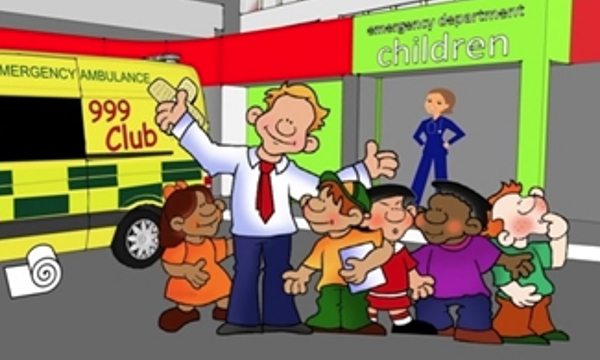 For any paediatric emergency department considering a similar scheme to the 999 Club at Southampton Children’s Hospital, Ms Knight says ‘it’s well worth doing’ because the children who attend remember what they have learned. ‘We sat down at the start and went through what, fundamentally, we wanted to get across during the two-hour session. Working with South Central Ambulance Service, the hospital invites visits from schoolchildren from reception year and above. They come from across the south of England to tour the paediatric ED and meet staff. As well as handling equipment and learning about observations such as pulse and blood pressure, the children find out about nursing, medical and paramedic roles, and take part in a trauma scenario where a young boy has run into the road and been hit by a vehicle. Part of the aim is to enable them to experience what it might be like to be a nurse or doctor having to treat the boy. A realistic mannequin is used in the scenario. A recent local television news report captured pupils from a junior school completely absorbed in attending to the injured ‘child’ – stabilising him with a neck brace, listening to his chest with a stethoscope and bandaging his injured limbs. The two-hour sessions include a drink and a snack, a quiz designed to test what the children have learned, a goodie bag for each child and a feedback game where they attach stickers to a target to rate their enjoyment of the different activities. Given the scheme’s success, are there plans to extend it to older children? ‘At the moment, we’re so overwhelmed with this age group that we can’t manage any more,’ Ms Knight says. Latest figures published by NHS Digital for England show that in 2015-2016, 2,096,128 children, aged 5 to 15 years, attended emergency departments (EDs), including walk-in centres and minor injury units, accounting for 10.2% of total attendances. Children and young people are more frequent users of EDs than adults, according to Quality Watch, a report published last year by the Health Foundation and the Nuffield Trust. It said that in 2015-2016 in England, there were 425 ED attendances for every 1,000 children and young people, compared with 345 attendances for every 1,000 adults aged 25 and above. The report argued that improving the health literacy and education of families was among the key principles for reducing high activity in paediatric emergency care settings. Among the ten most common conditions diagnosed on emergency admission for 0 to 24 year olds were viral infections, abdominal pain and fractures to the upper limbs.